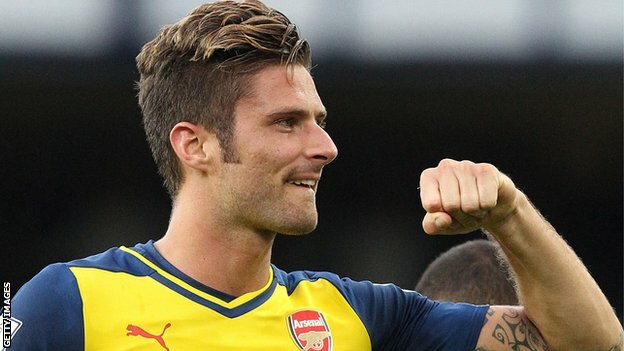 One of the main arguments and questions I had of Olivier Giroud was his performances and goal record in the big games – before last season, he had scored at home to Liverpool and at home against Spurs and that was it. A striker playing for Arsenal needs goals against the big teams and I was particularly keen to see how his performances would be the season just gone. He ended the season with goals against Man United at home, Liverpool home & away and a very important goal away to Man City – he even threw in one against Monaco in Monaco which sadly didn’t result in the great escape but certainly gave us hope. Thierry Henry caused a bit of a stir recently by saying Arsenal will not win the league with Olivier Giroud – he later went on to say when he, himself was playing, Arsenal had Wiltord, Kanu, Suker to come on and make the difference. The two comments slightly contradict each other but I believe Thierry Henry meant, with Olivier Giroud ALONE, Arsenal will not win the league and I think it’s tough to argue otherwise. Theo Walcott showed he has goals in him in the final game of the league season and the cup final and Danny Welbeck will want to prove he too can be a central striker but both are relatively unproven playing up top for long periods of the season in a title chasing team. I’m fully in the boat to give both a chance to be the Wiltord, Kanu and Suker and play a vital part this season rather than buy an average striker who won’t do a great deal better then what we already have. If that world class striker becomes available then I fully expect Arsenal to go for him, like they tried to do with Suarez and have been trying with Benzema for the last three years. Buying a world class striker does not mean Olivier Giroud is surplus to requirements – it means he now has team mates who can help him and help the club go for the big competitions in England & Europe. Olivier Giroud has a massive part to play in our future as he offers something quite different and is well suited to so many games in our league, however, he can’t do it alone. I’ve been quite surprised with the stick he has got for staying loyal (so to speak) and sign an extension (many will argue that he won’t get this sort of arrangement elsewhere and they may well be right) – I think clubs need a collection of players and certainly need a few in every position in order to be successful. I truly believe some of the frustration from supporters on Giroud comes from not having that world star who can turn a game in one moment, such as an Suarez or an Ageuro rather then it being anything personal on Giroud. In my opinion, Olivier Giroud had a good season last year and regardless of if anyone comes in, I back him to have another good season and hopefully get to that 20 goal mark for our fantastic football club.